Led by faculty at Montana State University and including collaborators from University of South Dakota and University of Wyoming, the WAFERx project began in 2017 when the team of scientists was awarded an NSF EPSCoR Track II grant. Upper Missouri River Basin (UMRB) to mitigate climate change. BECCS, while potentially lowering CO2 emissions, would require transformations in agriculture, land-use, and energy production systems, which could create trade-offs among food, water, energy, biodiversity, and economic opportunities. We seek to understand the implications of these trade-offs for the local people, communities, cultures, and ecosystems of the UMRB. 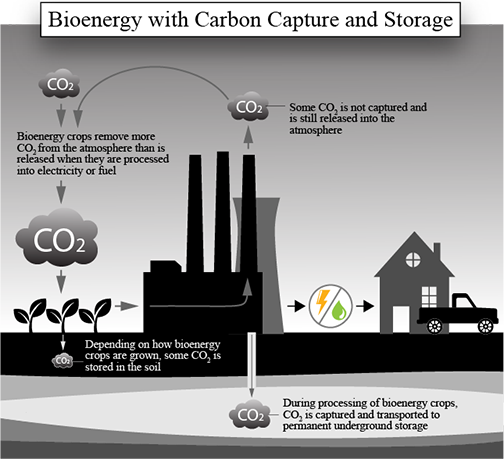 Bioenergy with Carbon Capture and Storage (BECCS) is a form of climate change mitigation that removes carbon dioxide from the atmosphere while also producing energy. BECCS reduces atmospheric carbon dioxide (CO2) first through the production of bioenergy crops, which pull CO2 out of the air during photosynthesis. The CO2 emitted when these crops are transformed into energy is then captured and injected into geologic formations underground for permanent storage. This results in what is referred to as ‘negative emissions’—meaning more CO2 is removed from the atmosphere than is released. According to the Intergovernmental Panel on Climate Change (IPCC), negative emissions technologies (NETs) such as BECCS, are vital to remove enough CO2 from the atmosphere to prevent global temperature from rising about 2 degrees Celsius—which is the tipping point above which the world would experience significant environmental consequences. The Upper Missouri River Basin (UMRB) is an important agricultural region that has potential for both bioenergy crop production and geologic carbon sequestration. Bioenergy crops currently grown in the UMRB include corn, soybeans, canola, and sorghum. Other small grain and oilseed crops that can be used as bioenergy feedstock also have potential in the region. Structural basins in the UMRB with potential for geologic carbon sequestration include the Bighorn Basin, Powder River Basin, Willison Basin, and Kennedy Basin. What will be the trade-offs between water, food, energy, biodiversity, and rural development if BECCS is widely adopted in the UMRB? Is BECCS technically, socially, and economically feasible in the region? How would BECCS affect food security? How would BECCS affect cultural values? What incentives are necessary for a BECCS economy? What impact does BECCS have on wildlife and wildlife habitat?